“Everything comes from land and ultimately goes back to it” explains an old Indian saying. All sense of value in an enterprise is rooted in the value of land. From business to warfare, the characteristics of land have the power to determine the ultimate success of the endeavour. From maintaining biodiversity to ensuring prosperity for all, the sound management of land resources is vitally important to the achievement of the Sustainable Development Goals (SDGs). The Asian Development Bank notes that more than 400 million Asians still lack electricity; roughly 300 million have no access to safe drinking water, and 1.5 billion lack basic sanitation. In many countries, power outages constrain economic growth. Development of infrastructure is a prerequisite for long-term sustainable economic growth. However, more than 8.8% of the GDP is needed to finance infrastructure-related projects in South Asia which are expected to have a spillover on the achievability of the SDGs. Yoshino, N., Paul, S., Sarma, V., & Lakhia, S. (2018). 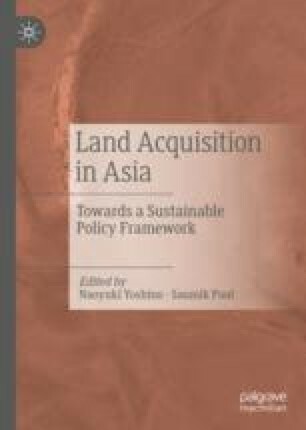 Land acquisition and infrastructure development through land trust laws: A policy framework for Asia. ADBI Working Paper 854. Tokyo: Asian Development Bank Institute. Retrieved from https://www.adb.org/publications/land-acquisition-and-infrastructure-development-throughland-trust-laws.